The Enterprise is our own leaky American ship as we love to envision her, stuffed with benign, theatrically accented foreigners all pulling together. 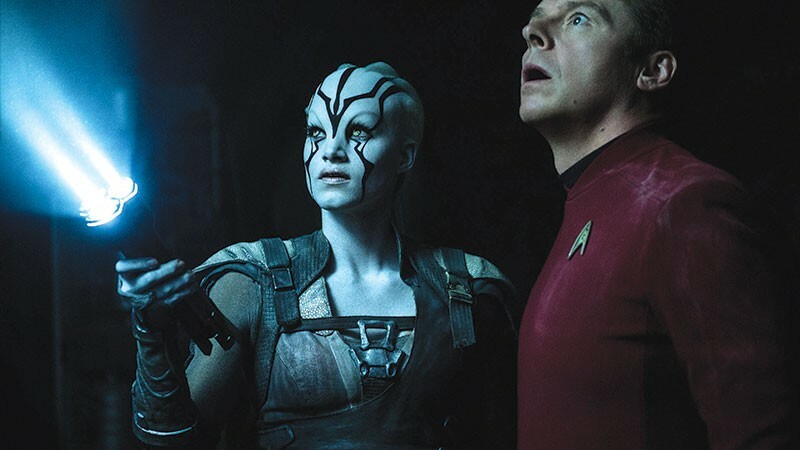 "My wee Scottish gran said, 'You can't break a stick in a bundle'," says Scotty (co-scriptwriter Simon Pegg) in Star Trek: Beyond. The latest in the sci-fi franchise comes out of the gate funny. Kirk (Chris Pine), a one-man diplomatic delegation, tries to return an unwanted cultural artifact to a planet of angry gargoyles. It's the 966th day in deep space. "Things have seemed a little episodic . . ." Kirk tells his log wryly. When the crew pull into Starbase Yorktown, there's an emergency to deal with: a captain needs rescuing after she and her crew crashed on an uncharted planet behind a formidable asteroid belt. All the wisdom of Starfleet Command is present (Shohreh Aghdashloo is particularly good as a wise commodore), but it's too bad Star Wars' Admiral Ackbar wasn't there to warn Kirk. The great ship is ripped to pieces by an enormous fleet of spiky fighter pods, leaving the crew shipwrecked on a rocky planet, with Spock badly injured. Help arrives from an alien scavenger, Jaylah (Sofia Boutella). With black terrapin stripes on her clown-white face, she looks like '60s star Ursula Andress done up by H. R. Giger. The lord of the planet is a two-legged iguana called Krall (Idris Elba). He's a minor Star Trek villain, but he fills the résumé as an asthmatic heavy breather who can growl the r's in "Kirrrrrrrrrrk." The Trek series is now like any other superhero series, with a wobbly range between the realistic and the ridiculous. But the movie is sworn to fun, and it delivers, with plenty of sci-fi drama and the long-legged Jaylah pouring herself all over the captain's chair. Strange, then, that the most emotional moment is the new Spock contemplating a relic of the old Spock—a photo of a group of portly men and one woman, in polyester and turtlenecks. 'Star Trek: Beyond' is playing in wide release in the North Bay.